DISCONTINUED. 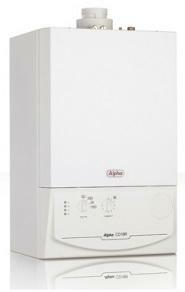 The Alpha CD12S is a gas fuelled condensing boiler which offers versatility through its considerate design and compact size. It is designed with the smaller home in mind or perhaps those with two bathrooms or less. Alpha's CD12S provides solutions to all the boiling needs of the smaller home. Its unusually reduced size means it takes up little space yet with an output of 12.8kW provides an incredible amount of heat energy for its size. The Alpha CD12S is replete with the functionality with which the range has become associated and is ideal for a smaller home. The efficient heat exchanger reduces harmful gases for the environment whilst simultaneously reducing heating bills. This means that it really is the right choice when it comes to making a smaller home energy efficient.